The trek to Annapurna Base Camp is popular but quite tough. We hadn't intended to do it but got a bit carried away, so rented some extra boots, poles, jackets and so on, and set off. 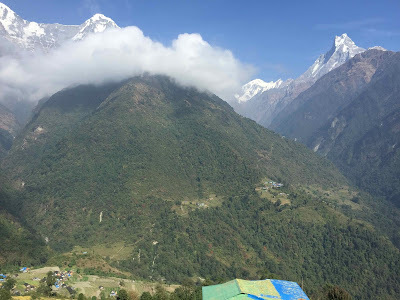 Our first stop was Ghandrouk, which is a sizeable Gorung village - one of the communities the Gurkha soldiers come from - our guest house had proud photographs of local men in enormous British Army shorts. Since Joanna Lumley successfully obtained rights for ex-Gurkhas to move to Britain, some of the properties have been abandoned. 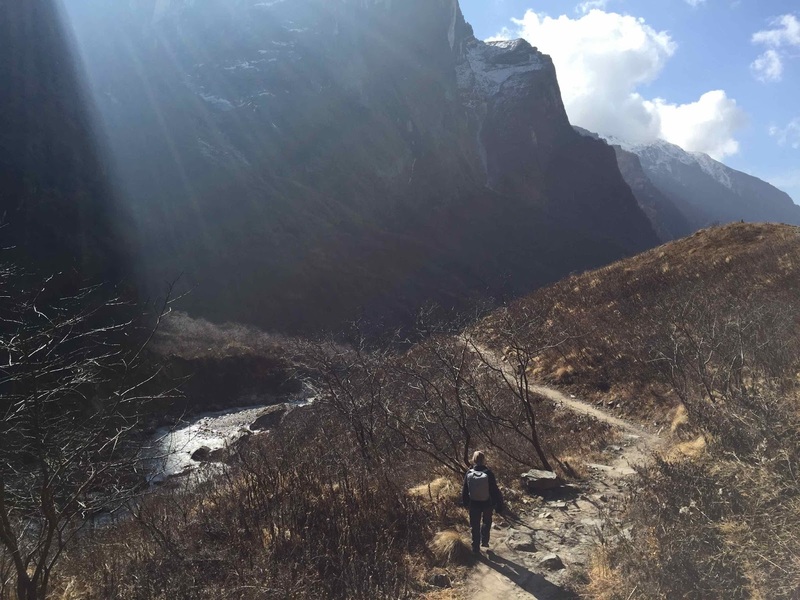 The road stops a few miles before Ghandrouk, and after that everything has to carried up on the backs of mules or people. The good news is that the trek just involves following a river for 2 miles – the bad news is that the 2 miles is vertical, from 1100 metres to 4100 metres. So it’s 4 days of slog upwards, quite a lot of it on steps. Even this would not be so bad if the path just kept on going upwards, but there are huge valleys to cross - after Chomroung we were staying on the hill opposite, but first had to plunge down to cross a river on a spindley bridge. The valley was more than 300 metres deep, like climbing down and up the Eifel tower. After two of these in a day, it all gets a bit wearing. I was grateful for my twin poles to protect my knees, but tough Kate just scorned such artificial support. End of Day 3 - distant view of Deurali where we spent the night. Kate holding my poles. We stayed in 'guest houses', which are situated about 2 hours apart. Basic rooms with a couple of beds for about £2 a night, but relatively expensive food - which is hardly surprising as everything has to be carried up on the backs of porters. Deurali even had a huge Italian expresso machine, which sadly was not working. 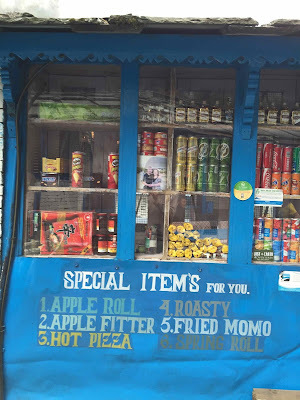 The usual wonderful spelling - anyone for an Apple Fitter or a Roasty? But everything from Tuborg beer to Pringles was available, at a price. The menus were basically a choice between spaghetti, noodles, macaroni or chow mein - all very filling and all remarkably similar. There was usually wifi, and even hot showers, or at least a bucket of hot water. But it was cold at night, and we asked for extra blankets (well I did, being the feebler member of the party). End of Day 4 - reaching Annapurna Base Camp at 4100 metres with Padam and Ramesh. Being old and having money, we supported the local economy by having both a guide and a porter, which was probably unnecessary but meant we carried almost nothing, and this makes a difference when going up and down miles of steep stone steps. Our guide, Padam, was wonderful and patient, while Ramesh our porter just kept on smiling and enjoying the trip, taking more pictures than we did. 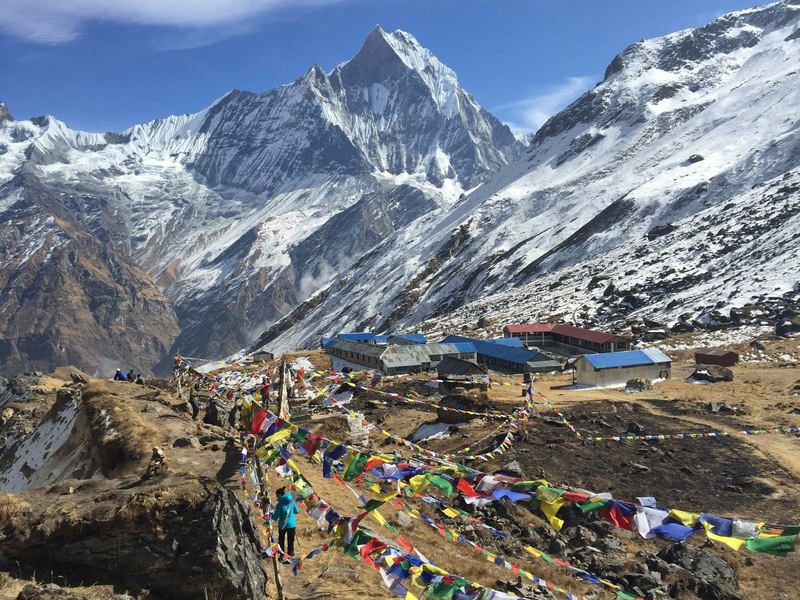 The view from above Annapurna Base Camp - prayer flags next to the glacier, and guest houses with a great view. 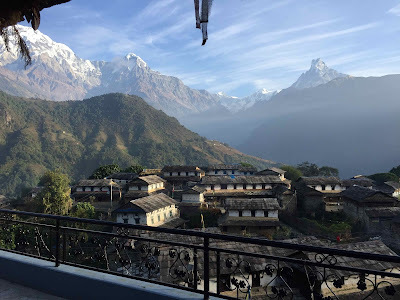 The area around Annapurna Base Camp (or ABC as it is known) is also known as Annapurna Sanctuary - surrounded by peaks up to 8000 metres, confusingly called Annapurna 1, Annapurna 2 etc. Tough if you climbed the wrong one. The whole area is dotted with memorials to people who have died there - the area is very popular with Koreans, and three of their top climbers disappeared on Annapurna 1 in 2011. 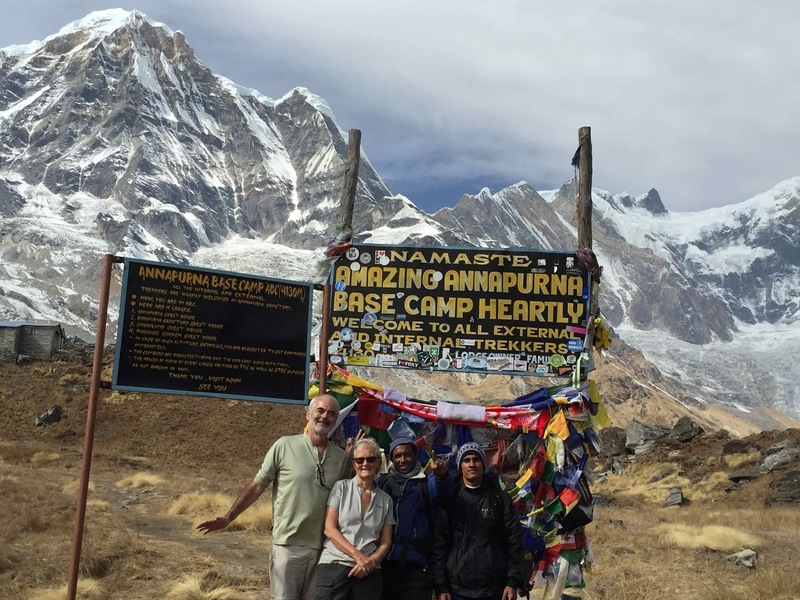 At 4100 metres, the base camp is just half-way to the top of Annapurna, but we felt no inclination at all to go further. The altitude was not too bad as we had taken 4 days to get there - a slight headache and thirst. Wonderful sunset, moonrise and sunrise. 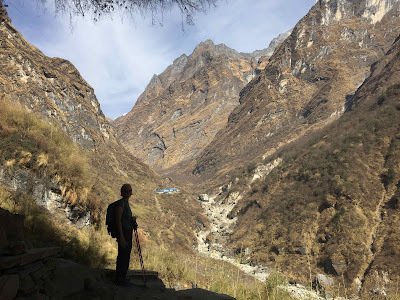 With some relief, walking down the valley on Day 5. We were so lucky with the weather - fine days and not too hot. It could have rained or snowed, and we had all the kit, which we fortunately did not have to carry and so could just focus on putting one foot in front of the other. 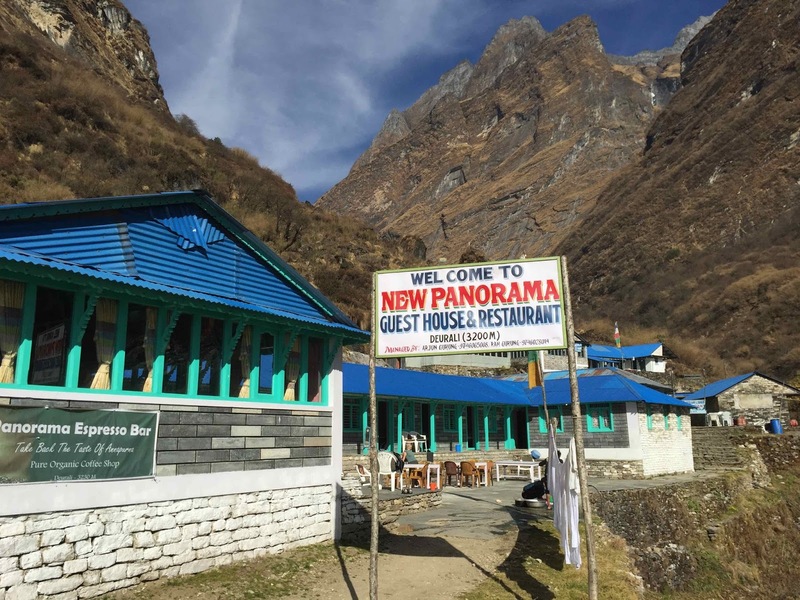 We just plodded on, for about 6 hours a day, stopping at guest houses for morning tea and lunch. All very civilised, and a bit like doing the South West Coast Path, but without the cream teas, and with some tough ups and downs. The earthquakes, and the current problems with fuel and cooking gas, mean that tourists have been advised to avoid Nepal and the country is suffering even more because of this. There was even a strike organised by the Maoists on the day we walked out, and we had trouble getting a tourist bus to take us back to Pokhara. But we have to admit that all this disturbance was to our advantage - this is generally a very busy route, with crowded guest houses and droves of trekkers, but we saw relatively few people and had the pick of the rooms. And, as usual in Nepal, everyone was helpful and kind. A great trip. 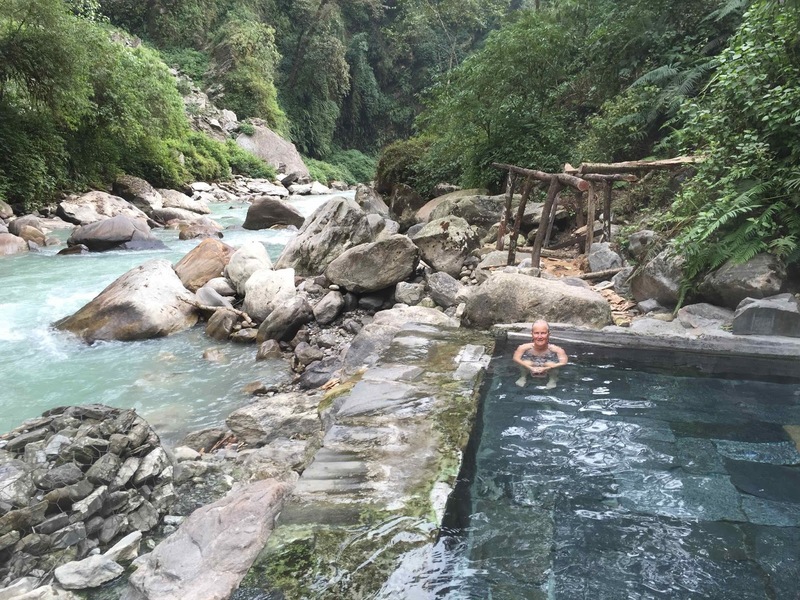 And if you need a great guide in Nepal, please contact Padam Raj Adhikari on gpadhikari92@yahoo.com .